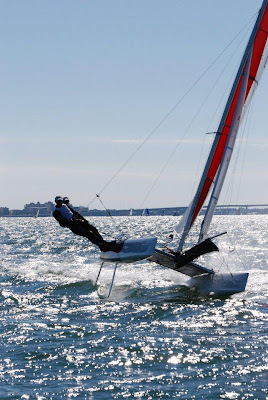 John Casey and Dalton Tebo win the Buzzelli multihull regatta on the Falcon! Well done guys! Last weekend was the Buzzelli Multihull Rendevous, a huge multihull event with classes such as the Stiletto, F-Boat Trimarans, Waves, Wetas, and of course our portsmouth A fleet, which included some F18s, F16s, Randy Smyth’s Scizzor trimaran and us. Since I sold my Nacra MK2 last week, Matt from Falcon Marine let me borrow his F16 Falcon. Thaaaank You Matt! The regatta started on Friday with a 35-mile distance race from Sarasota up to Tampa and back. We were a little late for the start, but on the close reach in 10-20 knots of breeze, the F16 took off upwind, bouncing over the waves. I was impressed with how much power stayed in the boat during the lulls even though Dalton and I weighed in at about 330 lbs. The double trap reach was so much fun we didn’t want to turn around. In the first half of the race we passed everyone but Randy’s trimaran. After the turn mark we gained until we were almost even with the tri that we gave a 12 minute lead to, but that was as close as we got. When the wind backed off the light wind designed Scizzor left us in the dust. Saturday was bouy racing and with a 10-15 knot cool northerly we were excited to get out there. The Falcon performed really well again, outpacing the F18s around the course. Upwind, the helm was light and the Falcon accelerated quickly in the puffs instead of tripping over itself like many other designs. The 12:1 cunningham worked well, and the Glaser mainsail flattened out evenly. I was again surprised with the amount of power the rig created. We were able to hold the upwind line of the F18s in lighter breeze, and could hold a higher line as soon as we single wired. Downwind I didn’t know what to expect. When you first look at the Falcon, since it doesn’t have much freeboard and even less bow, it looks like it might be prone to pitchpoling. Well, when we were on the boat and looked at the hulls from above it’s a whole different story. There’s plenty of volume in those little hulls. Even in the 15 knot puffs we were never close to putting the bow in, and actually the crew never went behind the rear beam on the trapeze. The volume and flat section between the bow and front crossbar worked well to keep the bow up and spray flying. We were grinning like crazy downwind! In the lulls the F18s did have a little deeper line, but when it was breeze on the Falcon was gone. Sunday was light and tricky, so there it was more about being in the right place than how fast the boat was. However, when we were in boat-to-boat situations the Falcon shined even when it was single trapeze conditions. In the end, the Falcon performed marvelously to give us a victory with six points to spare for the weekend! We have been very lucky with October's weather. 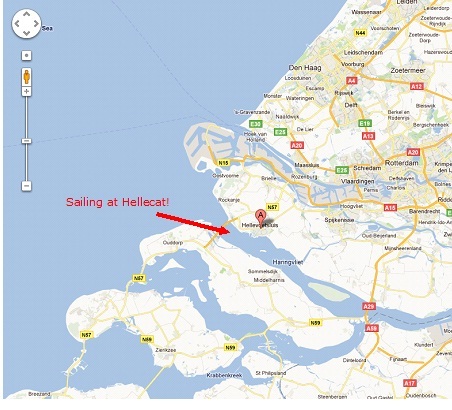 The last 2 weekends we sailed each Sunday 4 races at Hellevoetsluis, Holland and each time we had the sun as our perfect companion. The first Sunday (October 16) we had very light winds, very shifty conditions but nice sailing. Last Sunday (October 23) we only slept for 4 hours before we had to get up to race and the sun made sure we had enough energy troughout the 4 races :-) It was a good 5 BFT when we started race 1 and it dropped and shifted a bit during race 3, but for race 4 we had good steady winds again. The Oktoberbokaal consist of 4 Sundays of sailing in October on nice protected (i.e. FLAT!!) water in The Netherlands. The first Sunday we didn't participate because we were accompanying our VVW Youth Teams at The Veerse Meer (also in Holland). So after 2 sailed days we are happy with our 8th place overall. Can we make it to place 7 after next Sunday's last day? Weather forecast looks promising, sun and a 3 to 4 BFT breeze, nice! 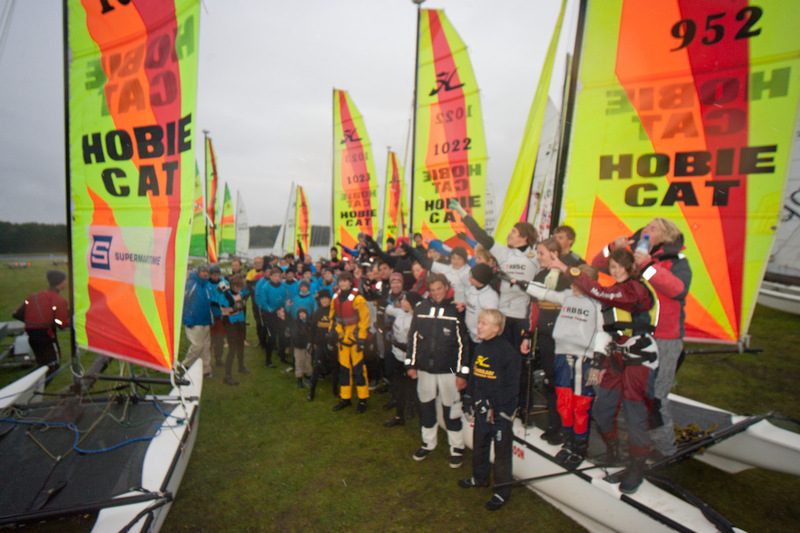 Last weekend we joined the VVW Heist Youth team on their trip to Catclub Zeeland for the Dutch Dragoon Cup. Located at the Veerse Meer we were happy to coach the youth sailors a bit. 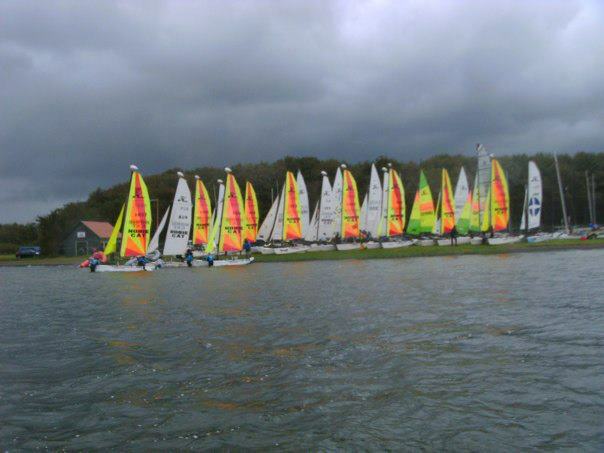 We also took our Falcon and Emile took his Blade so we took the 2 F16's out for a sail on the Veerse Meer. Gill has been talking alot about how cool it is to sail here, so I had to try this. I don't think it's really my thing, I was stressed knowing that there are alot of undepths and that we therefore risked of hitting the sand with our daggerboards. On Sunday we went out again and I got used a bit to the location and was more at ease. We had a great weekend, only downside was the weather. It rained all weekend. But the great hospitality of Catclub Zeeland and the great group of people made it a wonderful weekend! More pictures from us sailing at the Veerse Meer will follow! My birthday weekend was unique, celebrating in sunshine, bikini and 27°C. To start my weekend I had the day of work on Friday and we tuned our Falcon a bit, just relaxing on the beach, no wind to sail unfortunately. Saturday there was a bit more wind and we went out in the late afternoon. I steered and managed to get some speed in the boat. It was cool to practice the manoeuvres with this little wind. We ended the day with some nice spaghetti made by Caroline at VVW Heist. And then off to party in Brugge. On Sunday we organised a little apéro on the sandbank of Heist. One of the last times we could "enjoy" this sandbank since next year we will be moving to our new location, further along the coast, with hopefully no more sandbank in front of the club! Drinking cava in the middle of a sandbank with fellow sailors, how cool is that! Once the tide came in we drifted back to the beach on our boat, very nice! In the afternoon we relaxed some more on the beach and Sonja and me even went on a little "ride" with the Banana, very refreshing. Sour muscles the next day tough, haha. We ended the day with pizza and drinks at Maarten's caravan with Filip, Mathieu and Renke. Had a great weekend!